Looking at the body, mind and soul to answer the question: What exactly is a human being? Modern research is uncovering more and more detail of what our brain is and how it works. We are living, thinking creatures who carry around with us an amazing organic supercomputer in our heads. But what is the relationship between our brains and our minds—and ultimately our sense of identity as a person? Are we more than machines? Is free-will an illusion? Do we have a soul? Brain Imaging Scientist Sharon Dirckx lays out the current understanding of who we are from biologists, philosophers, theologians and psychologists, and points towards a bigger picture, that suggests answers to the fundamental questions of our existence. Not just "What am I? ", but "Who am I? "—and "Why am I?" Read this book to gain valuable insight into what modern research is telling us about ourselves, or to give a skeptical friend to challenge the idea that we are merely material beings living in a material world. 1. Am I just my brain? 2. Is belief in the soul out of date? 4. Are we more than machines? 5. Is free will an illusion? 6. Are we hard-wired to believe? 7. Is religious experience just brain activity? 8. Why can I think? Dr Dirckx is well qualified to investigate the question that forms the title of her book. She illuminates the widespread reductionist notion that the brain and the mind are the same and shows that it depends more on a presupposed naturalist or materialist philosophy, than it does on actual science. The author introduces us to the intriguing yet difficult problems of the nature of consciousness, free will and determinism and convincingly demonstrates that naturalism does not have the explanatory power that the Christian worldview possesses. This book is for the open minded, and will enrich the reader whatever their worldview. I whole heartedly recommend it. Laying out the arguments in her usual very readable style, Sharon makes a compelling case for why the answer to her book’s title [spoiler alert!] is “No”. Whether you agree with her conclusions or not, this whistle-stop tour of the hottest issues in neuroscience is a helpful, clear and concise summary of the different philosophical and theological positions, and the latest scientific data. Are we nothing more than the atoms of which we are made? Can humans be reduced to just the lump of gray matter between our ears? Are we, as the famous neuroscientist Francis Crick claimed, “Nothing but a pack of neurons”? This isn’t just a scientific question but one with huge implications, not least for what it means to be a person. 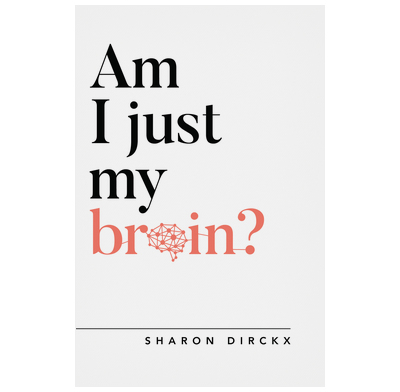 In Am I Just My Brain?, Sharon Dirckx draws upon her doctoral work in the sciences together with her years of experience explaining the Christian faith, to help the reader think their way through this crucial question and to respond, with clarity and compassion, to the increasingly shrill voices in our culture that want to explain away what really make us human. Whether you’re a Christian who wants to respond intelligently to new questions from neuroscience, or a seeker who suspects that the secular story isn’t the whole story, Am I Just My Brain? will help you get not just your head—but also your heart, mind and everything else that makes you you—around this fascinating topic.